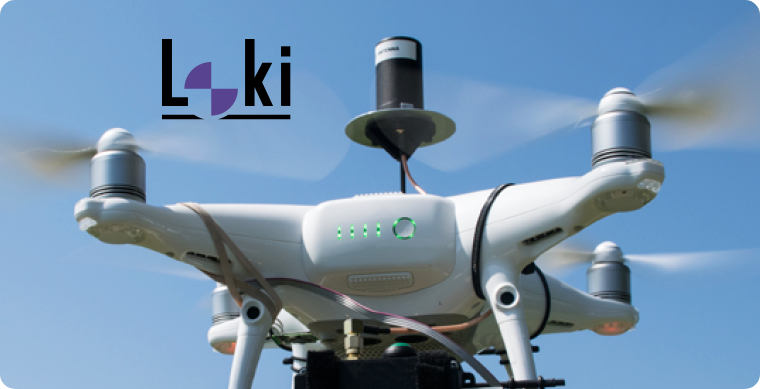 GeoCue Group Inc., through its wholly owned subsidiary, AirGon LLC., is bringing to market Loki, our third generation direct geopositioning system for small Unmanned Aerial Systems (sUAS or drone). Direct geopositioning reduces or, in some cases, eliminates entirely, the need for ground control points in high accuracy aerial mapping. Loki operates in Post-Processed Kinematic (PPK) mode, providing centimeter level estimates of the camera exposure stations for downstream processing by third party point cloud generation software. Via a personality cable Loki supports the DJI Phantom 4 Pro, DJI Inspire 2, and any bespoke system using a camera with a flash hot shoe. At the heart of Loki is the Septentrio AsteRx-m2 Global Navigation Satellite System (GNSS) engine, the most advanced sUAS-focused system available in the market today. The AsteRx-m2 supports multiple GNSS constellations, multi-frequency and very high noise rejection. In short, it will provide excellent positional solutions in challenging environments. While the obvious Return on Investment (ROI) is the reduction in labor and complexity yielded by minimizing the need for ground control points, the real return on investment is the fact that Loki makes a low-cost drone such as the DJI Phantom 4 Pro or DJI Inspire (with X4S camera) useable in mapping applications that require survey-grade accuracy. GeoCue has solved the problem of synchronizing camera events from the Phantom and Inspire with GNSS locations to cm level precision (we have patents pending on these techniques). Loki is a “plug and play” system and is therefore easily moved from drone to drone. It adapts to different cameras via a personality cable and can therefore move to more advanced drones equipped with high end cameras.